Help : The Physical Inventory Window allows you to generate inventory count lists. These counts can then be processed which will update the actual inventory with the new counts. Normally you would create inventory count lines automaticelly. If you create them manually, make sure that the book value is correct. Help : The Inventory Count Tab defines the parameters for a manual count and adjustment of inventory. 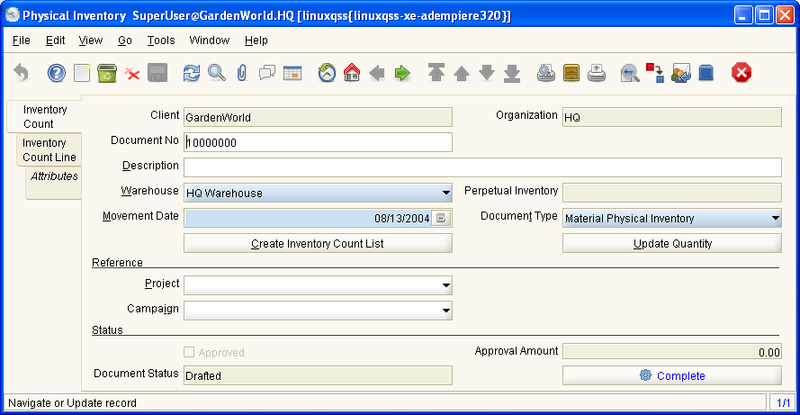 When creating the inventory count list automatically, only the actual stored products are included. The exception is when you select the equals 0 (=0) option, then zero on hand records of all stocked products is created for that location. Help : The Inventory Count Line defines the counts of the individual products in inventory. Normally you would create inventory count lines automaticelly. If you create them manually, make sure that the book value is correct. You can set the Organization, if it is a charge, otherwise it is set to the header organization. This page was last modified on 14 December 2006, at 14:10.